On February 1st a LPJ-GUESS development meeting took place at TUM in Freising. Ekaterina Sycheva presented on “Comparison of LPJ-GUESS results with long-term inventory data and simulation of management strategies” and Thomas Pugh gave a talk on “Self-thinning across biomes”. 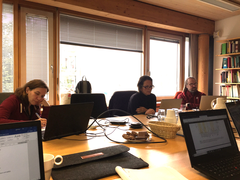 The presentations were followed by a discussion on European PFT parameterization for modelling forest management and effects of extreme events.